Today’s news of the arrest of Huawei Technologies Co.’s CFO, Meng Wanzhou, reignites the accusations of Chinese companies blatantly stealing intellectual property of US-based entities. In 2012, Envision IP analyzed Huawei’s US patent portfolio, and concluded that the company’s patent portfolio, at that time, seemed to lack innovation compared to similarly patented technology owned by Apple, Qualcomm, and Motorola Mobility. The conclusion was based on analyzing forward citations of these companies, which indicated that Huawei’s patents had relatively no forward citations when compared to the patent portfolios of its US-based peers. Back in 2012, Huawei owned approximately 1,500 US patents. The company has made strides in growing its patent portfolio over the last six years, with its US patent portfolio currently containing over 11,000 patents. The vast majority of its patents, nearly 10,700, were organically obtained by Huawei (either directly or through various subsidiary companies such as, for example, Futurewei Technologies). The remaining ~300 patents were acquired from third-parties. 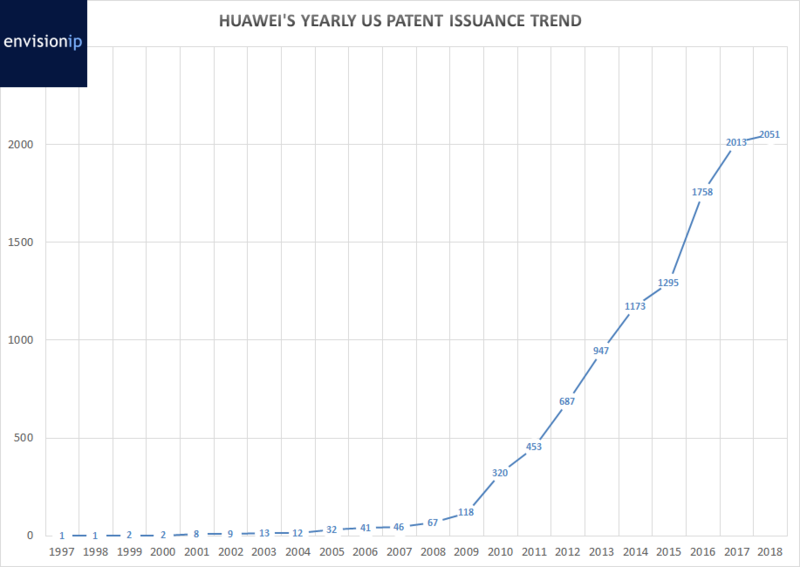 The chart below shows the year-by-year US patent issuance trend for Huawei, which has consistently increased every single year since 2005. Huawei has certainly become a tremendous patent owner, making IFI Claims’ annual list of largest US patent recipients in 2017. Huawei’s US patent application filing rate has also increased steadily over the same time period, as can be expected. From 2005 to 2016, the company averaged a staggering 45% compound annual growth rate in new US patent application filings. For 2017, Huawei is named an assignee on over 2300 published US patent applications, and 926 to-date in 2018. We expect these numbers to rise as US patent applications typically publish 18 months after their earliest effective filing date. Huawei has acquired a number of patents from various US and non-Chinese companies. Below is a list of the major third-party patent acquisitions by size for Huawei. It is important to note that acquired patents comprise roughly 3% of Huawei’s US patent portfolio. Regarding specifically US companies, IBM, Sharp, and top the list of patent sellers to Huawei. In our 2012 study, we concluded that Huawei’s 1,500 US patents at that time had any average of 1.2 forward citations per patent. We re-analyzed the forward citations, and Huawei’s roughly 11,000 US patents still have a relatively low forward citation count of 2.5 forward citations per patent on average. Compared to companies such as Apple, and Qualcomm which have well over 10 forward citations per patent, the citation data indicates that Huawei’s large US patent portfolio may still comprise primarily incremental improvements over third-party technology, rather than innovative and novel products, services, and hardware. Given the sheer size of Huawei’s organically grown patent portfolio, the company may not need to rely on acquiring US patents in order to have a freedom-to-operate in the US market. The lack of US patents is one barrier to entry into US technology markets for many overseas companies, however Huawei’s barriers at this time appear related to US governmental policies related to national security and technology protection. In addition, 32 of Huawei’s patents have been involved in US patent litigation, including against T-Mobile USA, Ericsson, and Samsung Electronics Co. Ltd.
Is there any scientific basis to link citation level with actual innovation? Apple’s average level of citations is much smaller than you might see in some other companies. For example, at Kimberly-Clark, we and our competitors would often submit very large lists of prior art even for minor innovations, and this prior art would largely focus on our work and a few competitor’s work, giving all of us nice levels of citations but reflecting competitive strategy and our industry’s IP culture rather than innovation per se. Asian companies and their IP teams grow up not worrying much about the uniquely US duty of candor in filing prior art, and thus tend to be far less likely to submit long lists of prior art in their applications. Companies in the Asian ecosystem thus don’t do a lot to lift each other’s citation level, while some IP teams in the US (and sometimes in sync with their competitors) routinely submit big collections of art. In 2015, Apple’s average number of cited patents in their granted US patents was 51, while Huawei’s was 19. Huawei’s level is surprisingly high, in my opinion, for an Asian company and reflects relatively high attention to US standards, but is less than half of Apple’s. Apple’s citations include many of their own patents, just as Foxconn’s citations also include many of their partner, Apple, contributing significantly to the signal without necessarily reflecting the absolute level of innovation in anything. In that year, Apple has an average of 3.8 citations per US patent (granted in 2015) versus 0.94 for Huawei, based on my analysis using PatSnap’s citation tools. That different really may not mean much. In sum, citation level can be strongly affected by the IP culture and geography of a company and can be easily gamed. Lower values from Asian companies, not used to submitting long lists of prior that cite the patents from their own estate and their partners’, might seem to have weak scores regardless of innovation level. I have been working in Patent Analysis (patentability, patent landscapes, etc) for more than six years and if I have learnt something about patent quailty quantifiers is that one cannot trust just one quantifier. The team that elaborated this report did very well in considering only the forward citations of US patents because US applicants have to inform to USPTO of the prior art that they know of. As a consequence US applications receive between 4 to 10 times more citations than applications from elsewhere. However there is the matter of US applicants citing what they are aware of, and that means citing mostly other US applicants. The reason why Huawei patents are receiving so few forward citations might have more to do with their R&D staff foreign origin than with their innovative potential.